Filed under: CUSTOMER OF THE WEEK! So excited to introduce you all to the newest member of our Customer of the Week club: Kim! Kim is the definition of “Go BIG, or GO HOME”, when it comes to buying glasses. 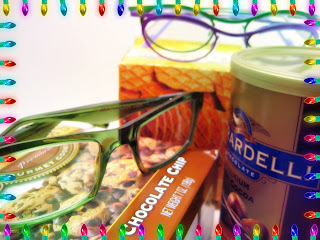 She came to us as an eyeglass virgin. Armed only with her new Rx, she hadn’t the faintest idea of what shape she was looking for…but she knew she wanted turquoise. 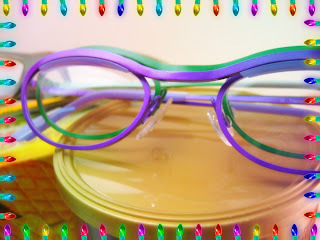 She quickly took a liking to the cat eyes and the round frame shape. There were so many frames that looked great on Kim … and when all was said and done, she couldn’t narrow it down any further; so the solution was to buy her top 3 favorites! Here, Kim is sporting her “a-dork-able” salmon-colored Gentle Monster “Fafala” frame. And finally, the Caroline Abram “Elsa” frame, which she turned into sunglasses. Not bad, considering we also give an awesome discount to those who purchase multiple pairs at once. Cheers, Kim! We hope you’re loving your new frame trifecta! This week, our Customer of the Week is BROOKE! Brooke has been a longtime friend to Eye Spy. We love when she comes in for a new pair of glasses because she is always up for a change! 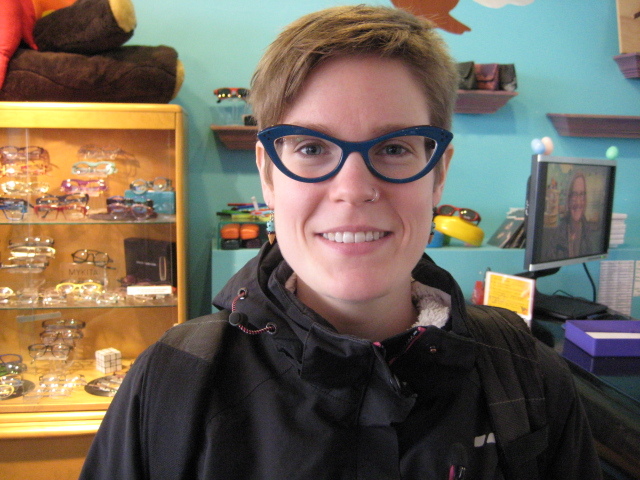 This year, she made the switch from a fuschia and purple titanium frame to this brand new Theo plastic frame. This frame has a brown to green fade that sets off the angles and design to make it much more than your typical plastic frame. Way to go, Brooke! 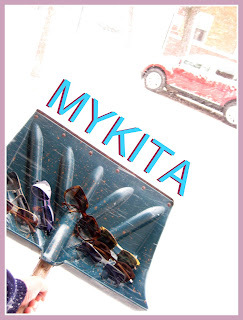 You’ve hit another eyewear home run! 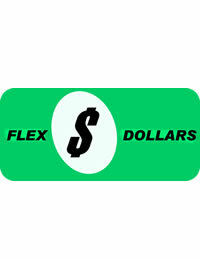 Too many flex dollars, not enough time? At Eye Spy, we accept flex dollars and will make sure that you find quality handmade glasses as well as the best possible lenses for your prescription. Just ask and we’ll be happy to help you find an *awesome* new pair of specs! We will be closed on December 24 and 25 as well as January 1. 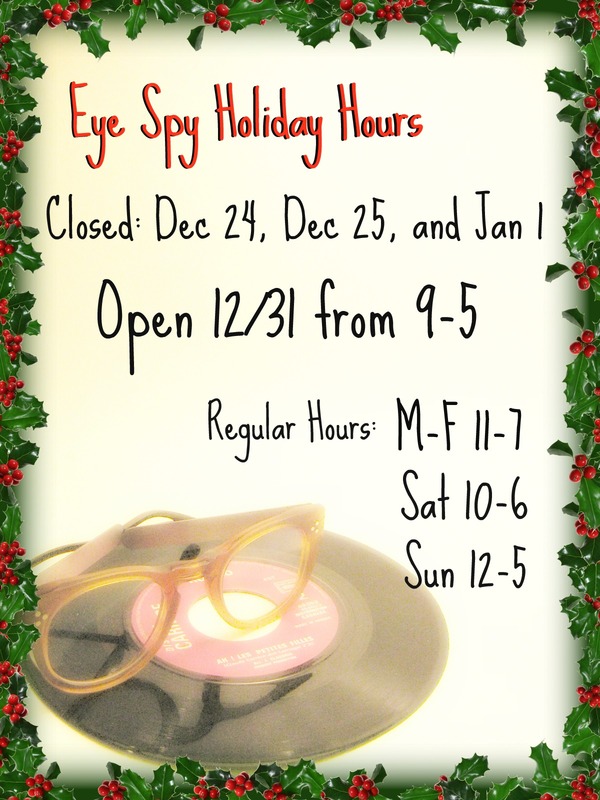 We will be OPEN on December 31 from 9-5. Our Customer of the Week this week is ELISE! 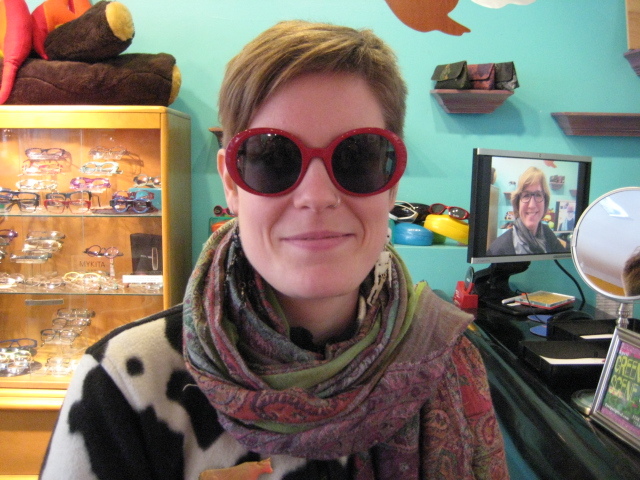 Elise chose this fantastic Anne et Valentin frame for it’s bold style and super-duper comfort! We love the way the color of this frame, which is a gradient tortoise with a touch of red looks fantastic with her red hair. AND, we absolutely love the way this Anne et Valentin frame highlights her beautiful big eyes! We were just shoveling our sidewalk and look what fell from the sky during the snowstorm! 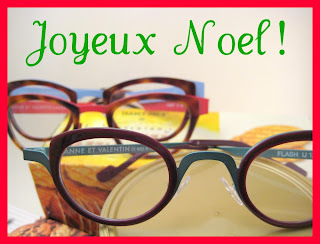 This week the Specs Therapist chose the Anne et Valentin Lap as her Employee Pick! This frame is sugar and spice and everything nice! It’s unicorns frolicking in a dandelion meadow. It’s Candy Cane Lane in Adorabletown. It’s sing-along fun and mirth! This frame is cozy blanket and a good book. This frame is ring around the rosy. It’s Glenda the good witch. It’s the center of a cinnamon bun. This frame is snow angels. This frame is marshmallows expanding in a cup of hot cocoa. This frame is DELIGHTFUL! Try it on and just see if you can suppress a smile. Filed under: Anne et Valentin, EVENTS! GIVE to a good cause! 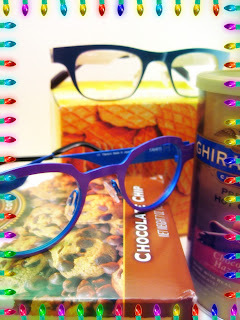 GET awesome glasses! Whatta deal! 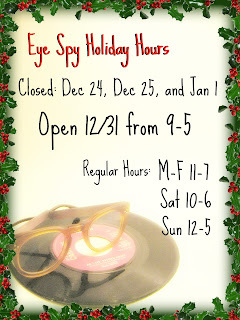 This is going to be an extraordinary weekend at Eye Spy! We have new Anne et Valentins in stock–all part of the latest collection and we can’t wait to see them on our customers! We also have decided to help out a local organization that’s in some need. The Howard Brown Health Center is trying to achieve a fundraising goal of $500,000. Thanks to the generous donations of strangers AND friends, they are 80% of the way to their goal, but every little bit helps and we want to lend a helping hand. SO, we are donating 1% of our profits for this weekend (Saturday, December 11 and Sunday, December 12) to the Howard Brown Health Center. We’ll also have some hot cocoa and delicious cookies for our friends who brave the cold, YUM! 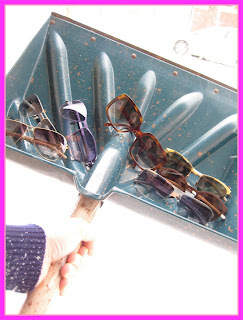 At Eye Spy, we love winter! OK, we don’t love the low temperatures or the slushy, wet snow, or the delayed buses and head colds. We DO love hot chocolate that somehow tastes sooo much better when it’s cold outside! And we really love cozy sweaters and scarves. And wow-oh-wow, do we love to decorate the store and make it a Winter Wonderland inside and out! 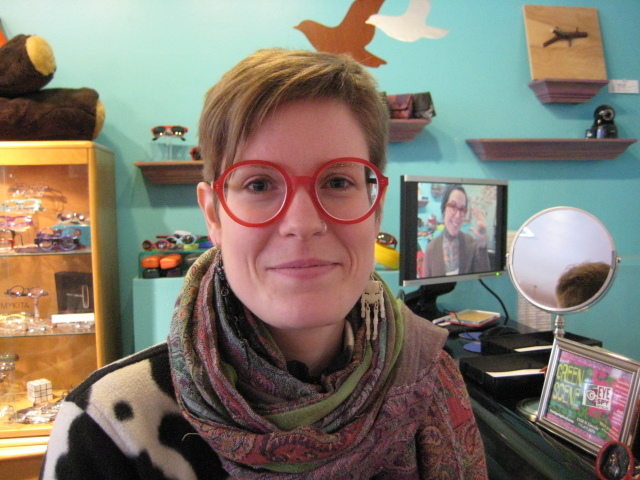 Inside, we have a new eyewear line, Claire Goldsmith, direct from jolly old England. We also have a TON of new Eyebobs readers and bucketloads of new Theo frames, Anne et Valentin frames, Francis Klein frames, and Lafont frames. Outside, we’ve put up sparkling lights in the window so that, even when it snows, you’ll be able to find Eye Spy’s shining lights on Lincoln Ave.
Doesn’t it just look so warm and cozy in there? We put up our favorite window decorations, included a section for Christmas with little elves an ornaments and a Chanukah section with a menorah handmade by our own Queen of Specs! We’ve made the store a cozy and warm place to hang out and get out of the cold while you’re looking for new glasses to go with your winter wardrobe.